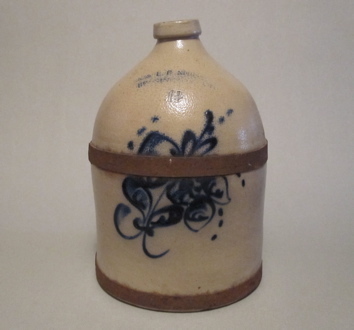 Another favorite of mine, purchased from the same collector who graciously sold me the set of five Lambeth jugs. 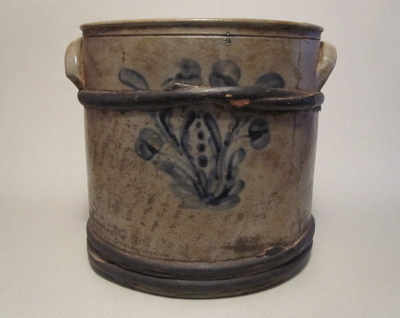 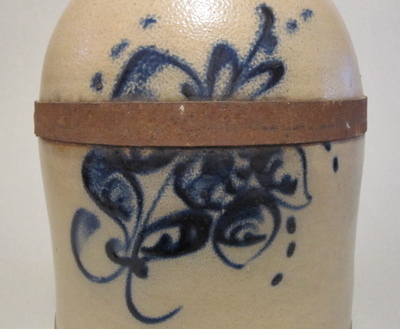 This 11-1/4″ high stoneware crock, most likely from New England, has an incised “4” to indicate it has a capacity of four gallons and is decorated in a cobalt slip abstract floral design. 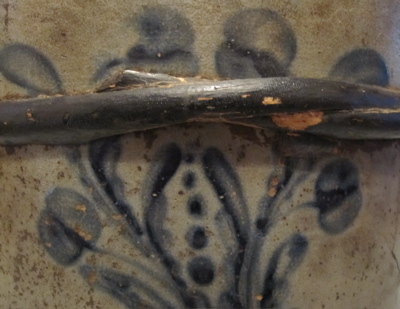 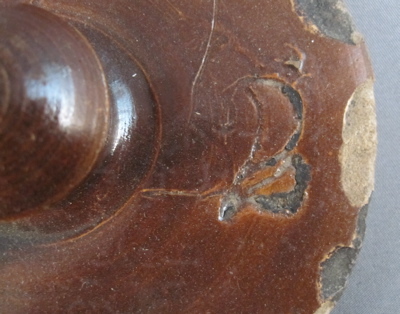 This beauty also sports one of the most unusual repairs I have seen, as the large cracks are held tightly together with woven willow. 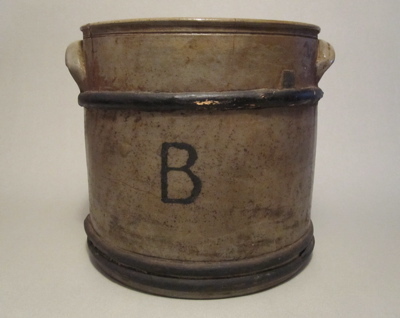 I was destined to own this piece, as a hand painted letter “B” (the first letter of my last name) appears on the reverse side of the crock. 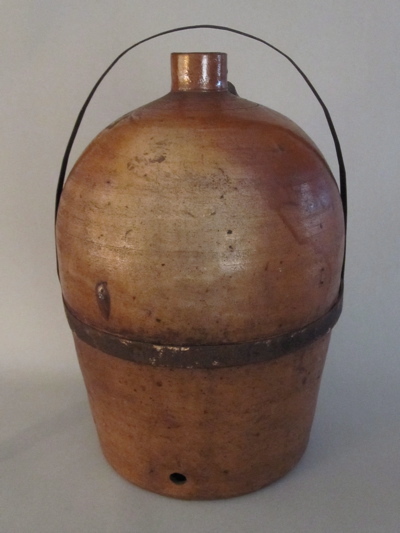 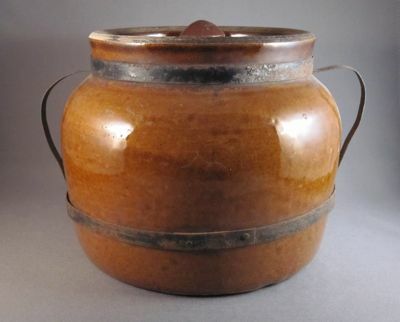 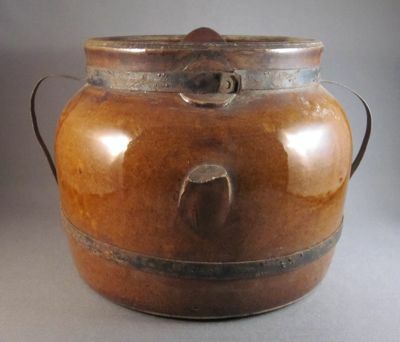 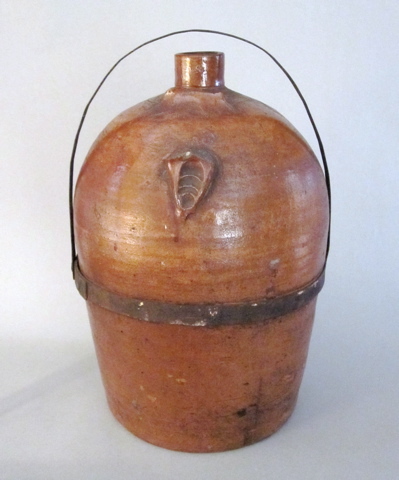 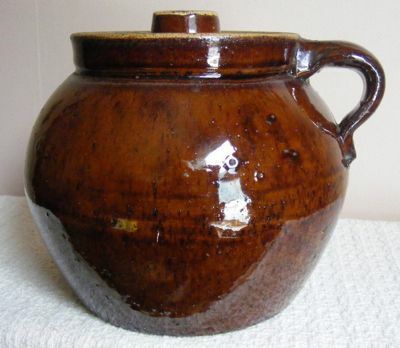 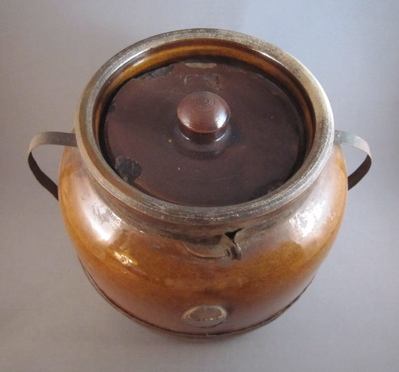 American brown glazed stoneware bean pot with lid, measures 5-1/2″ high and is 8-1/2″ wide from handle to handle. 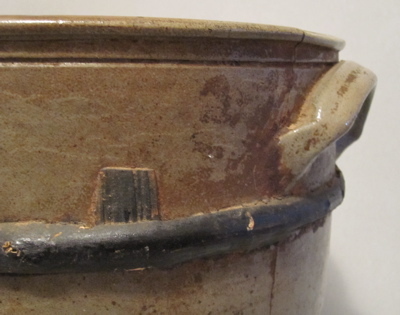 A mismatched lid from another piece has been “married” to this pot. 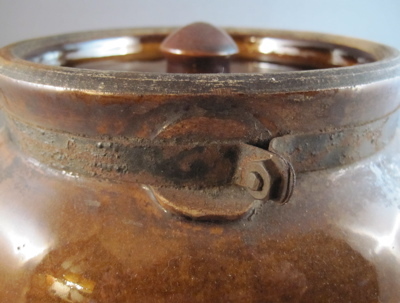 The lid has an incised number “2” on the top right edge. 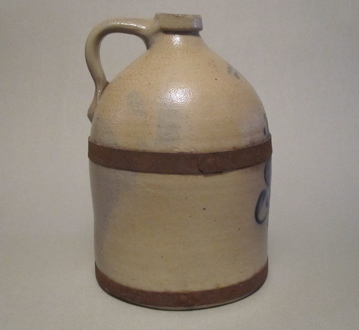 This was most likely made in Ohio or Pennsylvania in the late 1800’s. 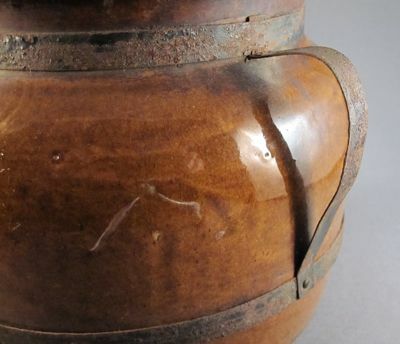 When the single applied stoneware handle broke off, twin metal handles and straps were attached to “improve” upon the original design. 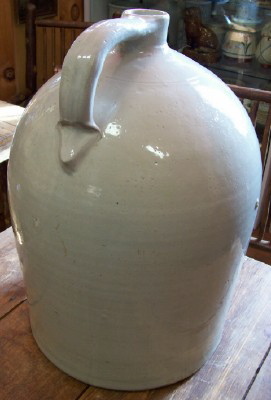 The small, lightweight handles are out scale with the heavy pot and have become misshapen from use. 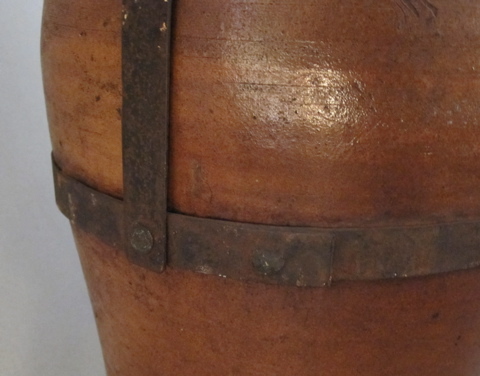 A metal support strap around the top has a bolt and nut to insure a tight fit. 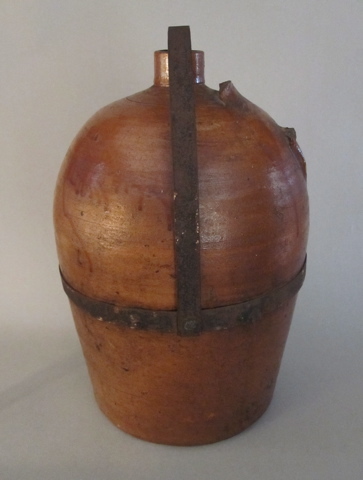 This pot still has its original single handle.